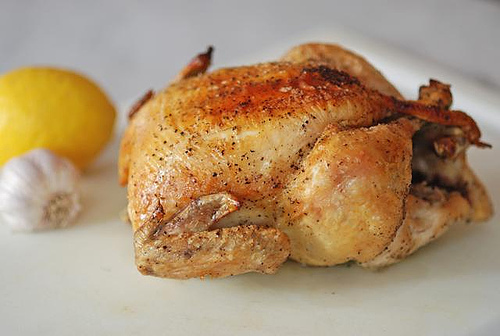 Oven Baked Whole Chicken. Everybody needs to, at some point in thier life, be able to cook a bake a whole chicken in the oven, it's like a life skill. I have greatly simplified the process here to give you the confidence to go ahead and do it. Now please be aware that this recipe is for a Oven Baked Whole Chicken only, it doesn't cater for all the trimmings like roast potatoes, vegetables etc. You'll have to go elsewhere for that, at least untill I've gotten around to writing up my ultimate roast potato recipe. Untill then it remains my secret! TIP: You can add other vegetables like peppers and potatoes if you so wish. Find a big enouhg oven dish to put all you ingredients in. A large casserole dish will be fine. Add a little water an oil to the pan. Put the chicken in it and spread the other ingredients around it. (squeeze the lemon a little). Baste the chicken in a light coating of honey and then sprinkle with rosemary and black pepper. Let it cook for about 45 minutes. Remove the pan and take off the cover. Scoop up the liquid that surrounds the chicken and and pour it on top of the chicken a few times. Put it back in the oven for another 90 minutes or untill it has cooked through. Remove every 30 minutes or so and do the liquid scooping thing again. By the end most of the liquid should have dissapeared. Don't forget this is simple simple simple so add more ingredients and flavors if you want.